Created in 1978, UNOSEL is a non-profit association federating 68 members, organizers of educational and language tours for schools, for young people and for adults. To become UNOSEL member, each organizer has to follow labeling process, if all the criteria are fulfill, the organizer gets UNOSEL Quality Label. For 40 years, UNOSEL has been active in the development of educational provision for young people and adults. It is the largest federation of language schools and of language and educational tour organisers. In 2017 UNOSEL represents 53 000 individual language stays abroad, 380 000 people taking part in school and educational group tours, 45 000 people taking part in holidays camps. UNOSEL sits on the NF-Service Special Committee (“Comité Particulier”) for Language Study Tour Organisers. As an expert in the field, UNOSEL took an active part in the creation of the European Standard for language tours and language courses under the aegis of the European Standards Committee (CEN – Comité Européen de Normalisation). Members of UNOSEL are a mixture of large and small structures, companies or non-profit making organisations who, within the association, all have an equal say in decision making. For operational purposes, members work on five committees: Educational Tours for Schools, Language Study Holidays for Young People, Language Study Holidays for Adults, Language Schools, Educational Tours for Young People and Adults. These committees meet very regularly to examine and discuss each sector’s problems, to invite experts in the field for their opinions, thereby making progress in the quality of each sector. These committees are UNOSEL’s life blood. It is within them that the majority of decisions are taken, and the Federation’s positions on different matters are decided. They also provide a forum for members to exchange information and ideas about the way their activity is evolving and developing. In October 2003, Jacques Maillot was elected President of UNOSEL. Founder of Nouvelles Frontières, generally recognised for his knowledge of the travel market and international relations, as well as for his contribution to the development of mass travel, as early as 1974 J. Maillot had diversified NF’s range of programmes by introducing language travel. Jacques Maillot was re-elected as President of UNOSEL on March 17th 2016. For young people : language holidays in France and abroad. For adults in France and abroad: walking tours, cultural tours, holidays, flying …. For schools : classes for all seasons, autumn, winter ; nature classes in the countryside, discovering the natural environment, creative arts, science, courses in culture and the arts, classes outside the normal school environment…. UNOSEL was founded to advise and protect consumers of language study holiday and educational tours for young people and adults by ensuring that their expectations were satisfied. Among other things, this pre-supposes that the client deals with a professional organisation that complies with current French legislation. UNOSEL maintains regular contact with prescribers, ministries, tourist information offices, local authorities, multi-national companies, professional organisations, parents’ associations, consumer organisations, and workers’ council representatives. This ongoing search for dialogue enables us to be aware of each others’ problems and to contribute to finding possible solutions. UNOSEL is a strategic and technological observatory over the language learning business. This enables us to collect important information about markets, products and consumer expectations. UNOSEL encourages the development of relations between existing institutions to attain common objectives. Observance of the European Standard EN 14804 : for language tour or training organisers, published in October 2005. The standard is applicable to language tour organisations . In October 2005 this standard replaced the French standard that the members of UNOSEL had been observing since the end of 1999. The French standard had been created by language tour professionals in conjunction with parents’ and consumer associations as well as government, including the Ministry for Young People and Sport, the Tourism Ministry, and the State consumer protection Office. This standard was the basis on which the European standard was made, and French regulations for language study holidays is now based on its requirements (Decree of the 1st August 2006, Ministry for Young People and Sport). The standard sets out the services offered by language tour organisers, and the ways in which they are to be provided, and thereby makes client / supplier relations that much easier. Observance of the UNOSEL “Statement of Commitment” for organisations belonging to the educational sector. – These inspections are carried out by independent experts first at the head office of each member of UNOSEL, then in the field during a tour. To ascertain that the information required by law to be included in the brochure or on the website of the member organisation selling package tours, is in strict compliance with the requirements of the French Code of Tourism. To ascertain that the particular conditions of sale do in fact exist, and that they comply with the requirements of the French Code of Tourism, the Consumer Code, and the advice of the government consumer protection organisation (DGCCRF). To ascertain that the information or other forms of words required by the Language Tour Organisers’ Standard and by UNOSEL Quality Charters are present in the members’ brochures. All members accept that in the event of a dispute, and when the client file in question has not been dealt with in the expected time limits, it should be submitted to the Board of Directors whose decision is final. 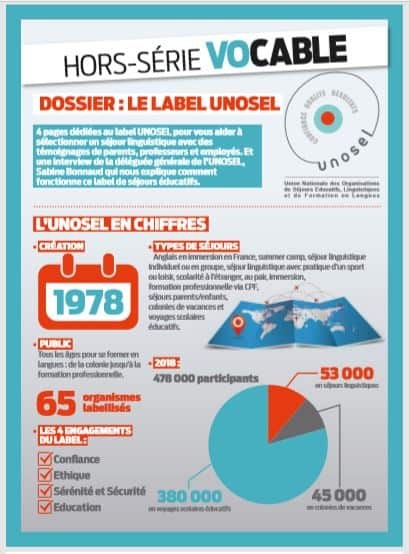 Member organisations of UNOSEL offer products and services to people of all ages, to private individuals and to businesses, in France, Europe and throughout the world. They offer a complete range of monitored educational and language teaching products, services and advice to adults, young people, teachers and people working in the field of professional training. Since its foundation in 1978, UNOSEL has been active in the search for quality, and in promoting this throughout the profession. In the area of language learning, the standard, which applied initially in France, and is now extended to the whole of Europe, serves as a benchmark for all the professional organisations working in the field, whether they are non-profit making organisations or commercial companies. It is the basis of an approach to quality common to all. As of 2006 all UNOSEL members observe the new European standard, as they had observed the French standard since 1999. This standard contributes to the improvement of relations between language tour organisers and their clients by defining each critical phase of the services offered, and the performance thresholds to be achieved. It thereby enables us to see the areas in which services can be improved. ; It is a total commitment to client satisfaction. It enables members of UNOSEL to give their clients exact, clear and detailed indications about their company or organisation, accommodation and transport, teaching and other activities offered. It should indeed be considered as a precise list of specifications based on UNOSEL’S 30 years’ experience, a list of “instructions for use” in which each element contributes to the construction of a successful and worthwhile language tour. Thanks to the observance of this standard, and the fact that they can be inspected at any time by the relevant authorities, UNOSEL and its members have left behind the system of self-regulation by charter or internal quality contracts that still prevail in the rest of the profession. This standard also enables UNOSEL to emphasise in its inspectors’ reports the relevant performance indicators that show how each sector operates, and to develop the sector’s quality and safety levels. This search for quality has become one of the fundamental principles of UNOSEL policy, and remains one of its primary objectives. It is also why in January 2006, UNOSEL opened its doors to the area of educational tours for young people and adults, with the same desire for quality control. This constant search for quality and dialogue has contributed enormously to raising the profession’s image, and to giving credibility to UNOSEL’S activity and commitment in the development of education and language teaching policy. Developing contacts between key figures in the educational world in France and throughout the world, encouraging exchanges between different education systems, debating subjects which are currently of importance, and exchanging ideas through experience in the field …. It is through these creative ideas that UNOSEL is able to develop enduring relations with its clients and thereby to help them in their day to day lives to realise their objectives. The fact that we welcomed as an honorary member the Fédération des Parents d’Elèves (Parents’ Federation) “Peep” bears witness to this desire for openness and constant dialogue with all levels of the world of education, as do the contacts we have developed with EDV (Entreprises du Voyage), Seto (Syndicat des entreprises du Tour Operating), APST (Association Professionnelle de Solidarité du Tourisme), teachers’ unions, tourist information centres, French and foreign chambers of commerce…. ; contacts which enable UNOSEL to give greater value to its professional members and the interests of their clients. UNOSEL also maintains frequent contacts with the DJEPVA (Direction de la Jeunesse, de l’Education Populaire et de la Vie Associative) which is under the responsability of the Ministry of Education and Young People, and the Ministry of Tourism. Founded forty years ago, the aim of the Association is to promote and inform the public of the professionalism of its members, to develop consumer confidence by giving consumers genuine guarantees of service, and to keep its members abreast of new developments in the profession. The commitment of the members of UNOSEL is embodied in the European Standard on Language tours, and the UNOSEL quality charter. The Association regularly issues communiqués on subjects of current interest to the profession and prescribers.